If you told me 34 years ago that I would be a member of the Guard of Honour of the Sydney Swans footy club at the Sydney Cricket Ground (SCG), I would have said you’re crazy. 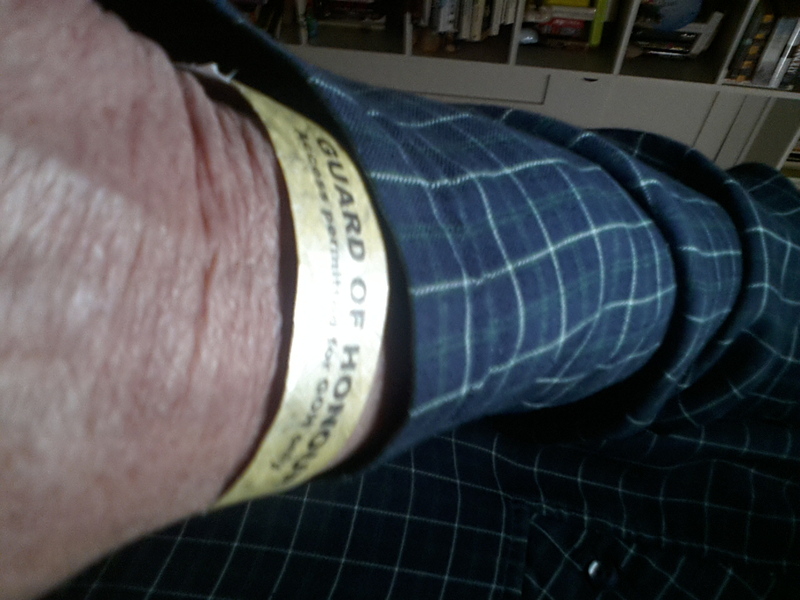 Guard, Me? Honour, Me? Well, I am an honourable man, or at least try to be, but lining up with other guards to high-five the players as they run through the team’s banner on match day is an honour I will always cherish. I joined the Swans in 1982 after they moved from Melbourne where they had a long and distinguished history as the South Melbourne Football Club, mainly to promote Australian Rules in New South Wales (Disclosure: I was a Carlton supporter in those days). Gradually as the Swans gained exposure and members, the club flourished under a management and culture that encouraged the code and embraced its supporters, including those who barracked for South Melbourne aka The Bloods, and I fell in love with the Swannies. I knew I was hooked in 1993, when the Swans were at their worst, having lost 26 games in a row, and played Melbourne at the SCG on June 27. They defeated the favourites that day and when they came off the ground, I had tears in my eyes. It felt like a Grand Final. Three years later the Swans were in a Grand Final against North Melbourne. It was a side featuring Tony Lockett and Paul Kelly but they lost by 25 points. I was there, producing a story for the Channel Nine Sunday Program about how the Swans would win the Grand Final. I had to change the beginning and the end (a montage with highlights of North Melbourne’s victory). The Swans did win the Australian Football League (AFL) premiership in 2005 – their first since 1923 as South Melbourne in the Victorian Football League (VFL). I was also there for that Grand Final, which I will never forget. The Swans beat the heavily favoured West Coast Eagles by 4 points when Leo Barry took a magnificent mark with seconds to go in the game. The next morning my wife and I travelled to the Lake Oval in South Melbourne where long-time Bloods fans brought their memorabilia and photos from 1923 as the victorious and hung-over Swans arrived by bus. When Club Champion Brett Kirk shouted “Bloods” as he got on the podium, there was hardly a dry eye on the ground. In that moment, the Sydney Swans and South Melbourne had merged into one happy family. I felt privileged to be there to see it. You can tell from the above I’ve become a Swans fanatic, and through both the lean and glory years, have screamed “Victorian Cheats” at bad umpiring decisions and “Percentage” when the team gets ahead, even by one point at the beginning of a game. Some of my screams from earlier days are not suitable for a family post. Now, I save them for outside when we lose, so that I don’t frighten the children inside the stadium. Ten years ago or so, I had my first invitation to a guard of honour ceremony at the SCG to celebrate the great players on the Swans’ Honour Roll, including Barry Round, Tony Lockett, Paul Kelly, to name just a few, as they were driven around the ground and we were placed every few metres to stand by our heroes. In my case, it was Barry Round, the first captain of the Swans, a great full forward whose kicking sometimes left a bit to be desired. In fact, he often used to hit the post, converting a goal into a behind. Naturally, every time any player hit the post, we would yell “Barry Round.” When I told him this as he stood in the back of the convertible on the night, he didn’t seem to appreciate my humorous gesture, though I did detect a slight smile as he turned away. I swapped these stories and more about Lockett and Round and Nick Davis who kicked us into the 1996 Grand Final with another Swans fan, Allan Cameron, whom I met on Saturday at celebrations for the Members Recognition Round. The function was held in the Indoor Cricket Centre next to the SCG where several hundred Swans supporters who’ve been members for at least 14 years gathered to hear special guests, former players Lewis Roberts-Thompson and Jared Crouch, present but injured forward Sam Reid and Josh Francou, the team’s stoppages coach. Hosting the event were two journalists, Ellie Laing, a friend and former Ten and SBS reporter now on maternity leave from her teaching job at MacLeay College, and Amber Greasley, a graduate of MacLeay now working at Seven Digital. Amber is also the girlfriend of Swans’ defensive ace, Jeremy Laidler. Jared Crouch talked about how the culture is different in Sydney, a city of a multitude of sports, to Melbourne where the game is a religion. He remembers the days of playing in the backyard in Melbourne with four young brothers. But he also mentioned the growth of Australian Rules in New South Wales. There were only half a dozen Aussie Rules junior clubs in 1978. Now the sport is played in schools throughout the state. Lewis Roberts-Thompson, humble as always, talked about other Swans, the imminent return of the injured Kurt Tippett and how much the club will miss Ted Richards who’s retiring at the end of the season. As soon as I mentioned Roberts-Thompson’s name, Alan Cameron said: “He should have won the Norm Smith Medal in the 2005 Grand Final.” Hard to disagree with that. Roberts-Thompson, aka LRT or The Hyphen, was one of the Swans’ key defenders from 2003 to 2014. He still looks like he could stop a forward in his tracks. Speaking of stoppages, that’s what Josh Francou works on. Stoppages are a Swans success story, led by players like Josh Kennedy, one of the best defensive midfielders in the AFL and a Brownlow Medal favourite this year, and the many debutants in the 2016 side. He admitted he doesn’t get as much time as he’d like to train the players because there’s so much to focus on during the week. Listening to Josh, you realise what a professional outfit the Swans are. As one of those old-timers – Allan reckons there was nobody under 40 at the function – I had trouble taking photos with my mobile as we gathered around the banner. The battery was running low, and it was hard to see what was on the phone. I got a couple of shots, but my son-in-law took a great photo from our seats in the Brewongle stand (picture at the top of this post). 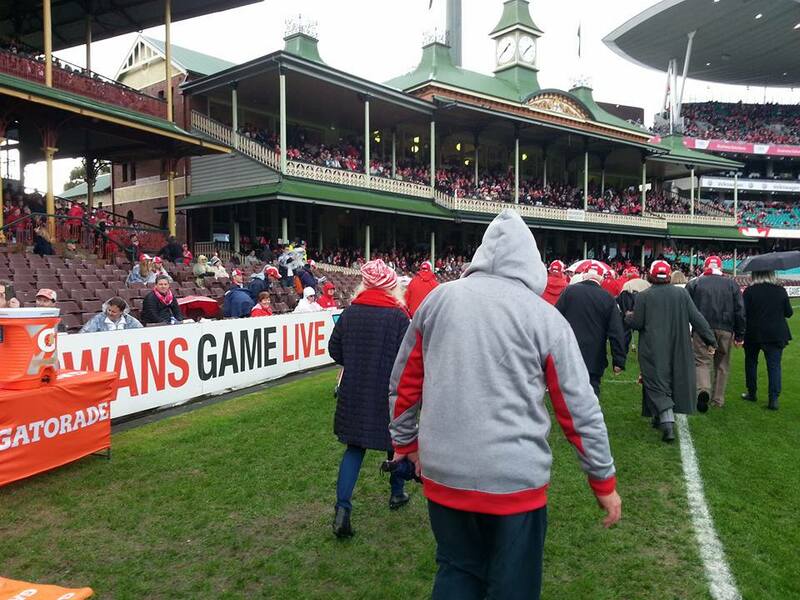 I am on the right side of the photo – hard to see but I’m only one guard of honour away from the banner – where I got high-fives from four of my favourite Swans: Dan Hannebery, Isaac Heeney, Gary Rohan and Aliir Aliir. FOOTNOTE: And lest I forget, I’d like to thank the membership staff of the Swans — Fern, Kathy, Amy, Melissa, Jamison, Chris, Nic and Anna – as always, the friendliest and most helpful I’ve come across in my decades as an Aussie Rules supporter. Thanks, Amanda (or has Tim borrowed your blog for a comment?). Even if you zoomed in on the photo, it would be difficult to see me. I had just high-fived Isaac Heeney and was about to high-five Gary Rohan. Aliir Aliir was my final target! Thanks, Betty. It was fun writing it.